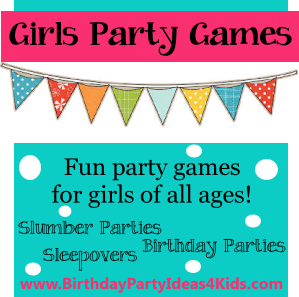 For more fun party ideas see our Sleepover games. Girls sit in a circle on the floor. There are two containers - one marked Truth and the other marked Dare. The first player then chooses a person in the circle and has them reach in the Truth container and pull out a truth question. The girl reads the question to herself and decides if she wants to answer it or not. If she wants to answer it then she reads the question aloud and then answers it. If she doesn't really want to give an answer to the question she folds the truth question back up and puts it back in the Truth container. Then they have to choose a dare out of the dare container and do what it tells them to do no matter what. We've created a big list of (rated G) questions for truth or dare and some fun dares for girls to print and use at a birthday party. Truth & dare questions. Aluminum foil is used to create fashions in this unique dress up game - find out who can create and design the best or most creative outfit from just foil. Fun game and girls really like making crazy looking clothes! Play	on teams or let the girls design their own creations and model the outfits themselves. Give each girl 1 or 2 big rolls of foil. Pass out pieces of ribbon, string or rubber bands to help the girls make the clothes stay on if you choose. Using the foil have the girls create and shape the most fabulous outfits they can. Anything can be made for the dress up game from the foil including skirts, shorts, blouses,	pants, tank tops, sunglasses, high heels, flip flops, hats, wigs, tiaras, jewelry, rings, earrings, belts and more. This game puts a girly twist to the game of "Hot Potato". Sit in a circle and give a pretty bottle of nail polish to the birthday girl. While singing the song pass the bottle around the circle. When verse is over the girl holding the bottle opens it and paints one of her nails. Then start the song again and keep passing the nail polish and playing the game until someone has all of her fingernails painted. You can give out prizes or just have fun singing along. Here is one version of the song ... you	can easily make it fit your daughters name and age with a little creativity. "Happy Birthday to Mary (birthday girls name) ... we're so glad she's eight - e, so we could come and play- e. Happy Birthday Mary! Thanks Roslyn from Indiana for the great idea! Make several drama bags by placing 5 or 6 different items in several large shopping bag. Separate into teams of 3 or 4 and give teams each a bag. Have the teams go to separate rooms and come up with a skit using the things in the bag to perform for the other teams. Each team gets 10 minutes to create their skit. Variation - Instead of doing a skit have the girls make up a song or commercial. How much do you trust your friends? A fun game	for girls where one person does the make up of another person ... while blindfolded! One girl wears a blindfold and the make up is laid out in front of her. Have another girl sit right in front of the one who is blindfolded. The blindfolded player then tries to put make up on the other girl while everyone else watches. When done the one who has on makeup gets to be blindfolded and the next girl in line sits down until everyone gets a turn. Ask the guests to bring with them a nice gift that they received that they don't like or won't use to the party. Ask them to	wrap the item so no one will know what it is. When the everyone arrive gather the gifts together and tell everyone you are going to have a prize auction. Give out $100.00 in paper play money. Begin to auction off the unwrapped gifts. Hold up the 1st gift and like an auctioneer ask who would pay $1 for the gift... keep bids going until there is one high bid. For fun add gag gifts and food items to the crazy auction items so they can bid on and win more then one item. After everyone opens their presents they can trade presents around or you can have them use their unused money to buy candy or small presents. Or have them bid and pay for who gets the first piece of birthday cake, what game they will play first , what music is played, etc. You will need Skittles, M&M's, or any other colorful candies. Put the candies in a big bowl with the girls sitting around it. Without looking each person chooses 2 pieces of candy then puts them in her mouth ... the other girls have to tell her if they are matching colors or different colors. If the candies are the same then they can chew and swallow them ... but if they don't match then she has to keep them in her mouth until her next turn. Then she chooses two more candies and tries to get a matching set. No chewing or swallowing until two candies are the same. You’ll need a new roll of toilet paper for this fun girl party game. Gather in a big circle and tell them you are going to pass around the game toilet paper roll and to take as much as they think they to play. Pass the paper around without any further instructions and have them take sheets of paper off the roll. After everyone has their sheets then tell them they have to share one thing about themselves for each square of paper they have. Buy a giant inflatable ball - like a beach ball - and write different questions or actions all over it in black permanent maker. All the girls stand in a big circle and the one who has the ball throws it across the circle to another girl. The girl which catches the big ball has to answer a question that is under her thumb. When they have finished answering (or performing the action) they throw it to another girl. Fun questions or actions for the ball are: Scariest movie ever seen? Favorite color? 3 words that are you? Favorite band? Favorite singer? Favorite film star? Nicest thing ever done for you? Meanest thing someone said to you? Worst phobia? If invisible you would? If animal which one? Secret crush? First kiss? A secret about you? Pet peeve? Or for actions: Stand on your head for 1 minute, hop like a frog around the room, bawk like a chicken for 2 minutes, Close your eyes for 1 minute, etc. Try and write things that would be funny and not too embarrassing or questions that would be fun to learn about someone. You will need plastic dishes and cups and two trays for this relay style game. Give teams a tray and the same amount of dishes and glasses ... or use plastic cups and saucers that have to be stacked if you would like. One at a time the girls have to stack all the dishes on the trays and carry them with one hand above their head to the opposite side of the room and back. If the dishes fall they have to pick them up, run to the start and begin again. For summer time and splash parties play this game outside and use glasses and cups that are filled with water that they have to fill, carry and dump into a larger container ... first team that fills up their container wins. Place several bright and fun nail polish bottles in front of girls who are sitting around a circle. Have the first girl choose a color and then lay the nail polish bottle on its side and spin it. When it finishes spinning whoever the cap of the nail polish bottle is points at has to paint just one of their nails that color. When they are done they pick a color of polish and repeat the process so someone new has to paint their fingernail the color they chose. Keep playing until all the girls fingernails are painted in a crazy color pattern. Paint your toes along with your fingernails to extend the game. Pardon Me, but what are you doing? Girls sit down and the first player starts by acting out an action such as combing her hair. The girl next to her asks her "Pardon me, but what are you doing?" and she has to answer with something other then what she is doing such as "Riding a horse". Then the girl who asked the first question begins to act out something and the nest to her asks the same question. Try and go as fast as you can without messing up. This girls party game is a variation to pinning the tail onto the donkey. Have the girls draw, color and cut out a pair of lips. Place some 2 sided tape on the lips. Buy a favorite poster that the group would like (I chose Zac Efron for example). Have the girls go one at a time wearing a blindfold and stick their lips on the poster after being spun around 3 times. The one that got nearest to the mouth wins the poster to take home! Give out bead necklaces to each person as they arrive. tell them that if they say birthday at all through the party they have to give the person they said it to their beads. The one who has the most beads at the party's end wins and gets a prize. (singing happy birthday does not count). To play: 1st give each group a skit and they have to dress up like there character. 2nd DON’T GIVE THE GIRLS REAL CLOTHES use aluminum foil, Saran wrap, and toilet paper!! To play one girl will have to stand in the middle, while the others create a circle of chairs. Then each choose a chair to sit on. The middle girl will say something like, "If you're wearing blue move to the right." Players then move to the right. However, if someone is not wearing blue they stay in there seat, and somebody ends up sitting on their lap! It ends up being a blast! Make up questions beforehand ... here are some examples: If you have brown hair move to the right. If your eyes are blue move to the left. If you hate spinach move to the left. If you think "_____" (insert boys name) is cute move to the right. If you've traveled out of the country move to the left.